I don't even know what to say about this recipe. Chris had a work outing one night, and since I only like to try fun new recipes when he's around, I decided to just throw something together based on what I already had available. 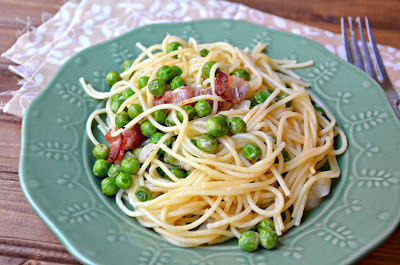 Peas, bacon and pasta? I gave it a try and wow, did it deliver. 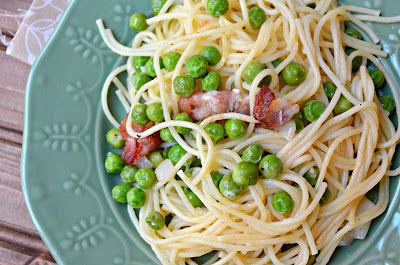 This pasta is extremely easy to throw together (even with a crying baby in the background!) so it's a perfect weeknight meal. 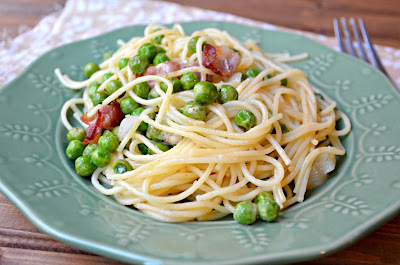 The bacon gives it tons of flavor and the peas make it somewhat healthy. Right? I top this with extra Parmesan cheese and it's good to go. Enjoy! Cook bacon in a large skillet until done. Add onion. Cook until tender, about 5 minutes. Add garlic and frozen peas. Season with pepper. Cook an additional 3-4 minutes. Add pasta to skillet. Pour chicken broth on top. Stir pasta. Add more chicken broth if necessary to loosen up the noodles. Add Parmesan cheese and stir. Serve immediately with additional Parmesan cheese.